World of Color, the evening entertainment show at Disney California Adventure is possibly the best thing you could do at the Disneyland Resort after dark. Disneyland has gorgeous fireworks but you can see fireworks in a lot of places. The Main Street Electrical Parade will be worth your time during its limited run, but if we had only one day at the resort, we'd choose World of Color every time. This water and light show features 1,200 fountains that create a 19,000-square-foot water screen. That's five times as big as a typical Imax screen. The fountains dance, fires flare, and more than 100,000 images flash by. The show features clips and scenes from many of the most beloved Disney films, and the fountains are choreographed to dance along with the music. You'll find yourself singing along (and maybe brushing away a tear or two). For added fun, you can purchase a special version of the classic mouse ears and other products that light up in colors that change in sync with the show. For more fun and entertainment while you're waiting for World of Color to start, connect your mobile device to “PierGames” on WiFi. You can play their Fun Wheel Challenge game and compete for a chance to control the lights on Mickey’s Fun Wheel for 30 seconds. The show lasts about half an hour. The schedule varies by date, with more shows in summer. Off-season, there are more shows on weekends than on weekdays. The best way: Call 714-781-3463 for lunch or dinner reservations at the Wine Country Trattoria, Ariel's Grotto, or Carthay Circle up to 60 days in advance. 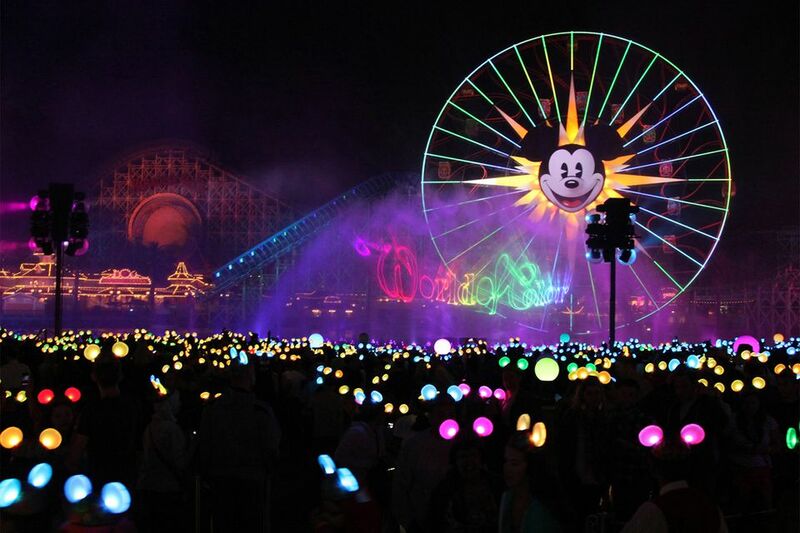 You'll eat in the restaurant and then get a pass to the best possible viewing area to watch World of Color. Get a FASTPASS: They're available when California Adventure opens, at Grizzly River Run. It's a good idea to arrive before California Adventure opens and get in line, especially if you want tickets to the earliest show. But not before you grab your FASTPASSES to Radiator Springs Racers. Everyone in your party must be present when you go into the park because your tickets must be scanned at the entrance before a FASTPASS can be issued. Walk up: This is the easiest way to see World of Color. You'll see something as long as you can see the water, but of if you work harder, you'll get a better view. From your hotel room: If you're staying in a room on the east side of the Paradise Pier Hotel, you can see World of Color from your room. Not only was World of Color an eye-popping show the first time we saw it, but it continues to evolve and improve. It can be as much fun for the tenth-time viewer as the first-time and is well worth the time to watch it. Disney used the movements of real dancers to help design the fountains' movements. The show takes its name from Walt Disney's Wonderful World of Color television show, which first aired in 1961. When they were building World of Color, Disney worked with the Orange County Water District to conserve and store the water in Paradise Bay instead of wasting it. The fountains can send water soaring up 200 feet in the air. To get a sense of how high that is, Mickey’s Fun Wheel is 150 feet tall. Wheelchair and ECV parking locations are available - just ask a cast member for help.